2014 is over, in a day or so. That means we are reflecting on the year that was, the phones that took up a major portion of our lives, which apps were the best out of the hundreds of new ones, and which storylines dominated these airwaves. But in the end, this site’s coverage really revolves around two things – what comes out of Google (Android, services, Google Play, etc.) and which phones are the best in the world. The Google stuff will be discussed in varying ways over the next day, so for now, it’s time to focus on the best phones of the year. I think it’s safe to say that we spent an exhausting amount of time in 2014 with new phones, trying to help you decide if one (or all) should be your next. That’s not to say we didn’t enjoy every single minute of it, but even as companies have tidied up their release schedules, releasing fewer phones than ever, we found time to review even more phones this year than any other year before it. That’s due in part because there were more good, all-around phones than ever, but also because you asked for them to be reviewed and because you needed them to be reviewed. These are the top 5 Android phones of 2014. Shortly after reviewing this year’s Moto X, I told myself that Motorola would not be repeating as the maker of the top Android phone in 2014 (they topped our list in 2013). While I enjoyed the phone at the time of review, something seemed missing that was keeping it off the top of the chart. And then I reviewed both the DROID Turbo and Nexus 6, two additional Motorola phones that are very similar to the Moto X, though very much different at the same time. While I enjoyed each, after reviewing them, I immediately found myself back on the Moto X. I missed it. That leather. That in-hand feel. That performance. That Lollipop. “No,” I told myself after a day back with it, “this isn’t it.” Back on the Nexus 6 I went. For one day. The Moto X returned to my pocket (again). And then the HTC One (M8) Google Play Edition got Lollipop! On to it I went, hoping it would take me through the end of the year. Two days went by and I couldn’t take it. This year’s Moto X, is the phone of the year and it is in my pocket for the foreseeable future. In a year where everyone has oversized all-the-things, Motorola has done so on the Moto X without being offensive (the same can’t be said for their Nexus 6). The Moto X grew, but it still fits perfectly in your hand and doesn’t have wasted space or length or girth. This phone was meant to be held, but also talked at without the need for your hand. Then again, with options like real Horween leather on its backside, you will want to hold it – a lot. Does it have the best camera? No. Best battery life? Nope. Are both of those things good enough? Yes and yes. The camera improved this year over last year’s model and is no longer the worst on the market. Battery life isn’t great, but a Turbo Charger can erase those worries. Outside of those two things, you have the best performing Android phone on the market, one that gets updates to new versions of Android before even Nexus devices, can be customized to your liking (for free), is sold affordably as an unlocked model, and includes a set of Moto features that you won’t be able to live without once they enter your life. The Moto X may not outsell any of the other phones on this list, but it’s still better than all of them. I killed the term “phablet” back in May. It’s an obnoxious word that causes instant headaches when spoken or heard. (Almost) No one should ever say it aloud. Well, there is one company that has the right to say it – Samsung. They do the tablet-phone hybrid like no one else. Sure, everyone tried to oversize all-the-things this year to compete with their Note line, but no one came close to executing a vision like the Note 4. The Galaxy Note 4 sports a gorgeous metal frame, doesn’t waste any space even though it has a 5.7-inch QHD display, and still features more “phablet” specific features that are useful than all of its competitors combined. From it’s insane battery life to its improved S Pen and beautiful AMOLED panel to a best-in-class camera, I don’t know that you will find a better overall phone from top to bottom. The only reason the Note 4 isn’t topping the Moto X is because of Samsung’s TouchWiz software and slow update rollouts. If Samsung was ready to give Lollipop to its Note 4 owners quickly or could find a way to ditch TouchWiz altogether, this would have been the phone of the year. It really is that close. In my opinion, there is a large gap between the Moto X and Galaxy Note at the top of the list before you get into the rest. Those two phones, without a doubt are the best of 2014. After that, you could really start subbing in phones at the 3, 4 and 5 slots depending on your particular needs or wants. Because the DROID Turbo tends to check off almost all of the boxes of “needs” and “wants,” it lands at number 3 for me. 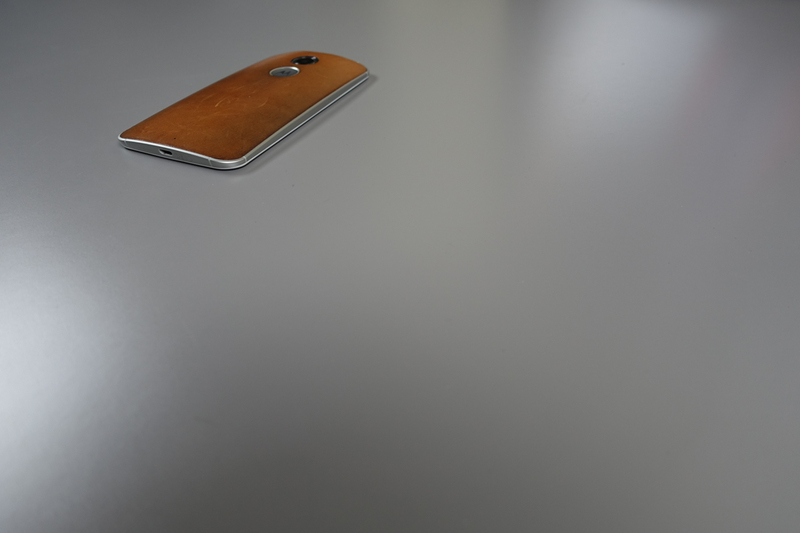 The DROID Turbo is without a doubt the first DROID phone that has mattered in years. In 2011, 2012, and 2013, Motorola and Verizon teamed up to offer DROID phones that were mostly behind the times in terms of specs and/or design or that tried to cheat customers out of $100 by offering up regular and MAXX editions. This year, however, that just isn’t the case. The Turbo has a QHD display, next-gen Snapdragon 805 processor, 3GB RAM, a 20.7MP camera, “pure” Android experience, and some really cool material choices for its backside. Oh, it also has a massive (I feel like I have to say it again – MASSIVE) 3,900mAh battery tucked inside its mostly-slim body. Sure, it has capacitive touch buttons that we could do without. We also wish it wasn’t stuck on Verizon. But there are almost no compromises here, which is saying something for a brand of phones that up until this phone, hadn’t had a hit in at least three years. Small phones (smaller than 5-inch display) that are actually worth using are a thing of the past, outside of Sony’s Xperia Compact line. With the Xperia Z3 Compact, you get a phone that packs all of the goodies you would hope to get from today’s flagships, but in a body made for those of us who hate the bigger-is-better trend. Sony won’t call it a “mini,” because “mini” tends to mean cheaper version of a company’s best phone. This phone, by no means, is a cheaper or lesser version of the Xperia Z3. The Sony Xperia Z3 Compact sports a Snapdragon 801 processor, 2GB RAM, 20.7MP camera, supports micro SD cards up to 128GB, and comes in a few fun color choices. It also happens to stand as one of the few battery champions in an Android world filled with battery hogs. Its camera takes really nice pictures, it is as waterproof as any phone on the market, and outside of a performance hiccup or two is a joy to use. But more important than anything, this phone fits perfectly in your hand. This is not a “phablet” or an oversized anything. This is a phone for people who want phones that are still phones. Outside of limited availability, the Xperia Z3 Compact is a phone with few faults. It’s also a phone I wish everyone had a chance to use for an extended period of time to realize how important it is to still have options like this around. I can’t tell you how painful it is to include this phone in the top 5 phones of 2014, but it is mostly because OnePlus is a company that is tough to like or cheer for. They do everything wrong. They offend people on a weekly basis. They are constantly putting at least one foot in their mouths. But in the end, this list is about the best phones of the year, not who makes the fewest PR mistakes. To me, company drama aside, the OnePlus One is a really great phone that has the best value of any phone in the industry. I reviewed the One back in July, during a time where there weren’t many other phones to review. I took my time with it because the summer tends to be slow while we wait for the fall season of phones to arrive. So I know the OnePlus One. I traveled with it. I took pictures with it. I lived and breathed OnePlus One. And you know what? There are still times where I wish it was back in my pocket. The battery life on this phone is out-of-this-world good. I have never tested a phone that lasts this long on a single charge. It also has great specs, a solid camera, excellent software that can be customized more than you know, an awesome textured back (at least on the black model), and can be had for as little as $299, which is without a contract. As of right now, my short list of most anticipated phones of 2015 includes whatever OnePlus is up to, even if that means months and months of PR nightmares. These guys can build a phone worth buying. And now, it’s time for you to give us your top 5. Who you got?